National Pizza Day: Our Favorite WDW Pizza Spots! National Pizza Day is February 9th and to celebrate we’re going to highlight our favorite places to grab a slice at Walt Disney World! 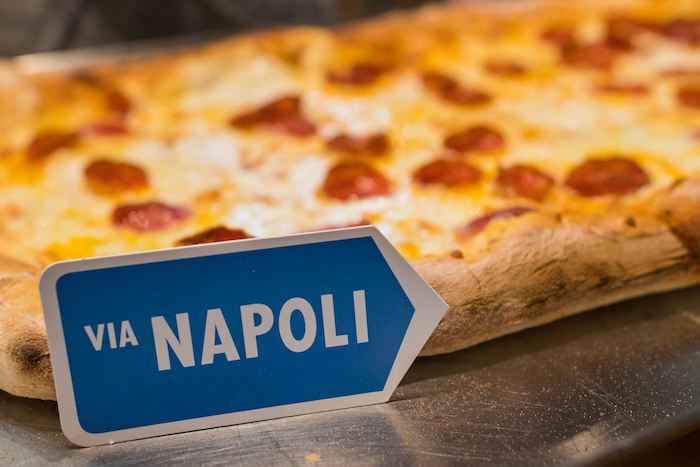 If you’re looking to satisfy your pizza craving at Walt Disney World, look no further than Via Napoli at Epcot. Recently, a few of our photographers got together for a quick lunch at Via Napoli and gave it two thumbs up! 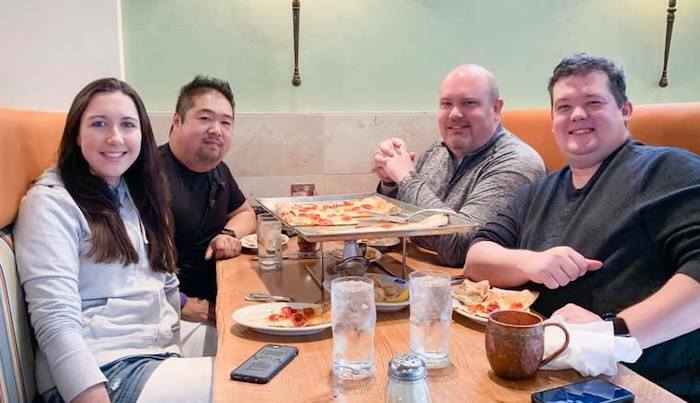 WDW Magazine photographers Courtney Reynolds, Cliff Wang, Judd Helms, and Brett Svenson enjoying a pizza lunch at Via Napoli. Via Napoli is located at the very back of the Italy Pavilion in Epcot’s World Showcase. As we all know, Epcot’s cultural theming is incredibly immersive and this restaurant is no exception. The decor is casual yet elegant, with muted earth tones and vibrant Italian art adorning the walls. At the front of the restaurant, you’ll find an open kitchen with three wood-fired ovens where you can actually watch the pizzas be made. If you’re in the mood for something other than pizza, don’t worry! The menu features a variety of appetizers, entrées, and desserts that showcase the tastes of Southern Italy. For our lunch, we opted for the specialty one-meter pizza to share with the whole table. The slices were cut in squares and topped with a generous amount of cheese and toppings. This isn’t your run-of-the-mill fast food pizza! The dough was light and airy with a nice crust from the wood-fired oven, and the cheese was perfectly melty. Yum! 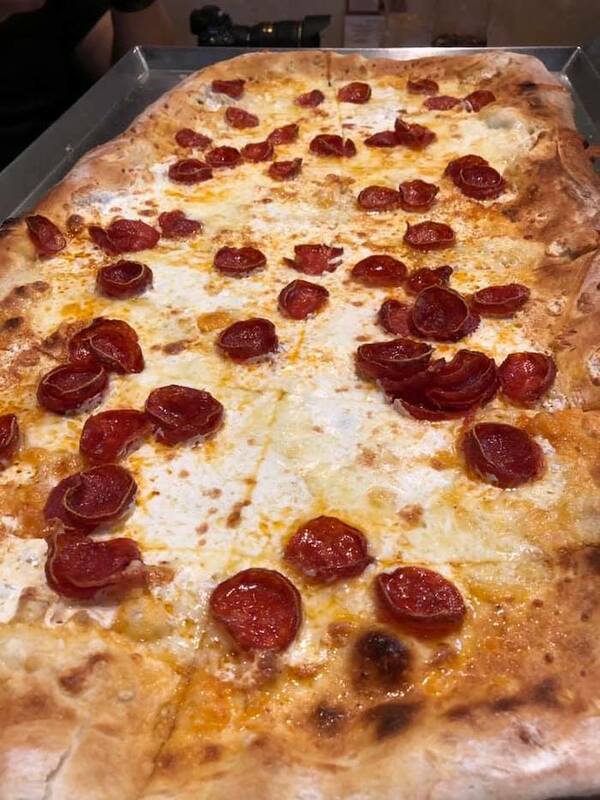 At Via Napoli you can get a one-meter pizza that can feed the whole table! Photo by Brett Svenson. Even though Via Napoli is a table-service restaurant, our lunchtime meal was pretty quick—but what do you do when you only have a few minutes to spare? Grab a slice of Via Napoli pizza to-go at the Pizza al Taglio pizza window. Photo by Laurie Jennings Sapp. Right outside of Via Napoli you’ll find the Pizza al Taglio quick-service window. 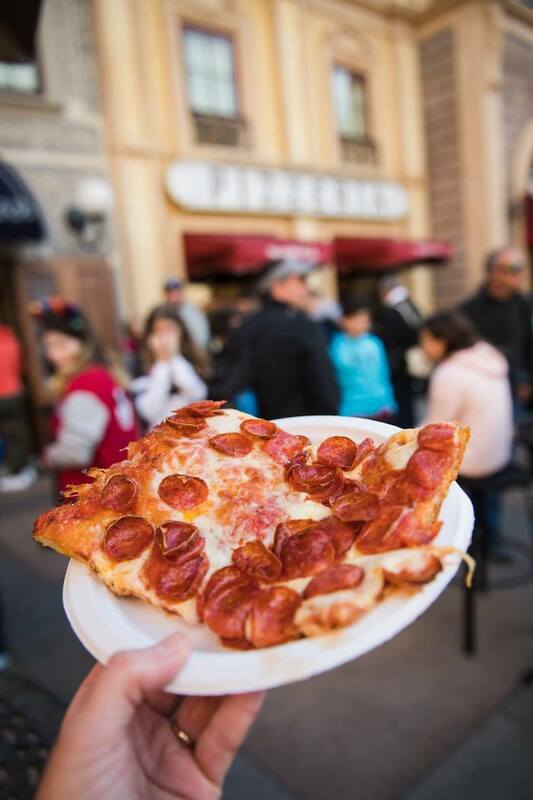 Whether you’re looking for a quick bite on the way to your next Fastpass+ or just looking for a slice of pizza without the wait, this is where you’ll want to go. There’s even an outdoor seating area for guests to enjoy their meal. Celebrate National Pizza Day Your Way! 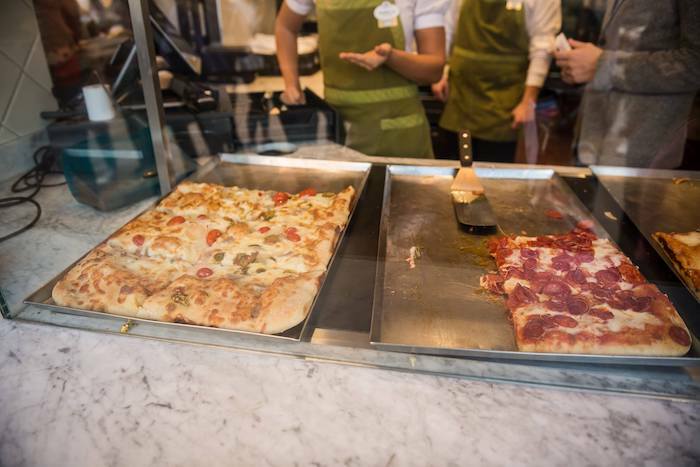 Pizza Ponte at Disney Springs is another delicious and authentic pizza-by-the-slice option. Choose a slice from a selection of ready-made pizzas like cheese, pepperoni, forest mushroom, and porchetta. The slices are huge and are a great value for the price! If you’re looking for a fully customizable option at Disney Springs, check out Blaze Pizza. You can pile your pizza with whatever toppings you want for one standard price. These personal pizzas are big enough to share with a friend or—if you’re a pizza hoarder like me—simply grab a to-go box to save the rest for later! 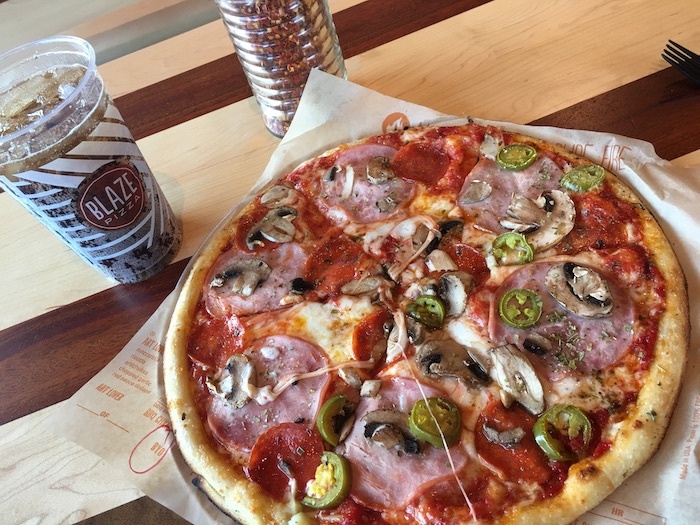 At Blaze Pizza, you can customize your pizza with any toppings you want for one standard price! Photo by Judd Helms. Whether you prefer grabbing a slice on-the-go or sitting down with the whole family, you can’t go wrong celebrating National Pizza Day at Walt Disney World!